Special Containment Procedures: A single instance of SCP-3778 is to be kept in a Standard Botanical Containment Unit in Site-103. Staff are not allowed to consume any instances of SCP-3778-1, due to the risk that instances of SCP-3778-1 may fall into the possession of an instance of SCP-3778-A. Absolutely no instances of Didelphis virginiana (the Virginia Opossum) are to be allowed in the vicinity of Site-103, regardless of whether they are an instance of SCP-3778-A or not. Any wild or otherwise uncontained instances of SCP-3778 are to be exterminated. Coordination with the UIU and GOC in targeting and eliminating the spread of SCP-3778 is ongoing. Instances of SCP-3778-A may not interact or communicate with any humans, with the exception of authorized Foundation liaisons. The tribes of SCP-3778-A will avoid human settlements as much as possible, with the exception of ██████████, Louisiana, due to reasons of cultural significance. Instances of SCP-3778-A will not attempt to cross the border fence separating the United States and Mexico, or attempt to gain entry into Latin America through any means. Cultivation of SCP-3778, either by SCP-3778-A or humans, is not allowed. The Foundation is to not actively detain any instances of SCP-3778-A, unless they pose an active threat to the Foundation or the Five Tribes, or are voluntarily participating in the Methuselah Project. The Foundation is to sway the domestic policy of the United States to preserve the Gulf Coast against the effects of sea level rise and other forms of climate change, as well as facilitate the creation of additional national parks. The Foundation is to deploy positive memetic devices on the internet to bolster the acceptance of the Virginia Opossum among the general population, and to discourage the concept of the Virginia Opossum being a form of vermin. The Foundation must focus significant resources on the Methuselah Project, which involves the extension of the lifespan of the Virginia Opossum. Details on the projected timeline of the Methuselah Project can be found in Addendum 3778-MPT. The Foundation must also stymie the technological progress of SCP-3778-A for as long as possible, while still maintaining positive relations. For this reason, all interference with the progress of SCP-3778-A must be conducted via clandestine operations. Stages of the Methuselah Project must not be completed ahead of schedule. Description: SCP-3778 is an anomalous type of Vitis Vinifera, or Common Grapevine. 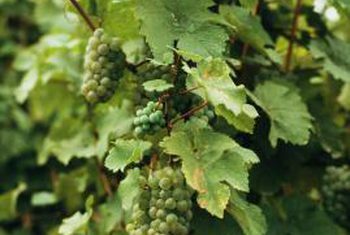 Like any other grapevine, SCP-3778 produces grapes (henceforth referred to as SCP-3778-1). While these grapes do not lead to any changes when ingested by humans, their anomalous properties manifest when they are consumed by any member of the genus Didelphis, causing rapid neural restructuring and development. Through ingestion of SCP-3778-1, any opossum can reach sapience. Opossums that have reached sapience through SCP-3778-1 are henceforth referred to as SCP-3778-A. SCP-3778, SCP-3778-1, and SCP-3778-A are all genetically and physically identical to their non-anomalous counterparts, making detection of these anomalies difficult. Upon reaching sapience, SCP-3778-A instances will attempt to enlighten their non-sapient counterparts. While opossums do not normally exhibit social behavior, instances of SCP-3778-A seem to attract other members of their species to them. This attraction appears to extend out ██km, though vocalization, sight, pheromones, and █████████ seem to aid the process. Once a sufficient congregation size has been reached, SCP-3778-A will provide SCP-3778-1 to the other opossums present, allowing them to also reach sapience, and thus forming more instances of SCP 3778-A. 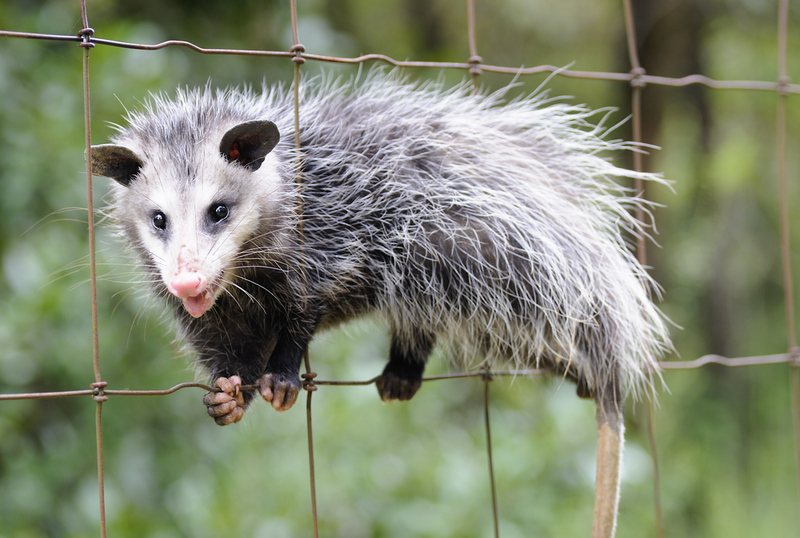 SCP 3778-A can also be created by natural birth between two instances of SCP-3778-A or one SCP-3778-A instance and a non-anomalous opossum. The intelligence of SCP-3778-A is comparable to that of a human, and instances are capable of learning human languages. SCP-3778-A shows special preference for learning and using Cajun, French, Spanish, English, and various forms of Creole, though these preferences are primarily attributable to the region that SCP-3778-A achieved sapience in. Due to the innate differences of biology between humans and opossums (specifically regarding the mouth and throat) SCP-3778-A instances vocalize distinct syntax patterns and accents that are markedly different from any human speech. Efforts to streamline communication between humans and SCP-3778-A are ongoing. As of writing, all instances of SCP-3778-A have coalesced into the aforementioned Five Tribes. See Addendum 3778-5T for details on each tribe. SCP-3778-A possesses a primitive albeit rapidly advancing technological level. SCP-3778-A, as of now, has technology comparable to humanity during the Early Bronze Age. While the Foundation maintains technological superiority, ██ years ago SCP-3778-A was at pre-agricultural levels, indicating a rapid level of advancement. Unchecked, SCP-3778-A may potentially lead to an SK-Class dominance shift scenario. Countermeasures are currently in place to prevent SCP-3778-A from gaining a large enough population1 or from gaining great enough political unity to mount an offensive against Foundation activities. The possibility that SCP-3778-1’s effects will spread from the Virginia Opossum to other members of the Didelphis family cannot be ruled out. As the majority of the opossum population lies in Latin America, coordination between the Foundation, the Mexican government, and various Central American nations have been dedicated to the elimination of suspected instances of SCP-3778. Goal: The aim of the Methuselah Project is to promote diplomatic relations between SCP-3778-A and the Foundation by aiding not just SCP-3778-A, but all opossums with curing one of their most ancient ailments: their lifespan. Most opossums only live two years in the wild, and up to four in good captivity. The truth is that this is far too short to be able to maintain convenient diplomatic relations. This fact also causes many instances of SCP-3778-A distress, upon learning of their short natural lifespan, and solving this issue would put SCP-3778-A in our debt. To facilitate trust between the opossum race and mankind, we propose that the Foundation begin the Methuselah Project. Through simple genetic engineering and viral therapy, we can increase the lifespan of the Virginia Opossum by over a factor of ten. Early 20██: The Methuselah Project will begin. 20██: The necessary genes for life extension will be isolated. 20██: Testing will begin. Testing is to be conducted on volunteering SCP-3778-A participants. 20██: By this time, testing is expected to yield positive results for genetic modification trials. 20██: Isolation period of modified SCP-3778-A will expire. If no long-term health problems are identified, Methuselah Project will move on to the next stage. 20██: Engineering of a suitable delivery method of the genetic modification (SCP-3778-B) will commence. 20██: If suitable delivery method is constructed, begin mass-deployment of SCP-3778-B via [REDACTED] to increase the lifespan of all instances of SCP-3778-A, and non-anomalous Virginia Opossums. The Five Tribes2 is the common name for the various hierarchical organizations that SCP-3778-A has organized itself into. Such polities are geographically based, and are in areas where the non-anomalous Virginia Opossum is also usually found. A map for the territory claimed by the five tribes can be found below. The Great Lakes Clans: Due to the low temperatures that the Great Lakes region reaches during the winter, this is the smallest of the Five Tribes. Until recently, the Great Lakes Clans engaged in conflict with its southern neighbors for food and territory. Upon discovery by the Foundation, all conflict was ordered to cease, and aid by the Foundation to the Great Lakes Clans has raised the standard of living, as well as easing political tensions between the Tribes. Shown in green. Appalachia: Appalachia comprises the eastern coast of the United States, and the Appalachian Mountains. It is one of the larger SCP-3778-A polities, and claims significant territory. Appalachia is also a production powerhouse, as it holds mineral deposits that are vital to SCP-3778-A’s technological development. Appalachia formed after seceding from the Gulf Empire, making it the second recorded SCP-3778-A state to emerge. Shown in pink. 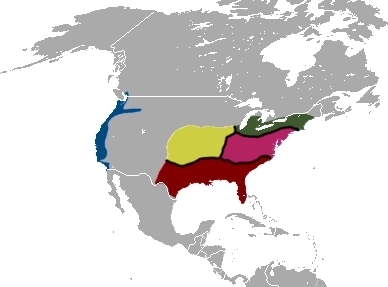 The Midwest Association: The Midwest Association occupies the outer reaches of contiguous opossum influence, and recently was observed making forays into Colorado for colonization efforts. The Midwest Association has since been ordered to cease expansion, under the pretense that they should “focus more on internal development first”. Shown in yellow. United Pacifica: United Pacifica is the newest of the Five Tribes. It has a larger population than that of the Great Lakes Clans, but holds less influence over intertribal politics due to its distance from the other polities. Shown in blue. The Gulf Empire: The Gulf Empire is the oldest and largest surviving3 entities of the Five Tribes, being founded in 1898 by Emperor Sesame I. The Gulf Empire wields significant influence over all other organizations, and has been the most vocal about the pursuance of the Methuselah Project. While once encompassing most of the territory claimed by instances of SCP-3778-A, rapid technological advancement and political turmoil have rendered it less powerful than it was at its height. Shown in red. Interviewed: An instance of SCP-3778-A, henceforth known as “Milkshake”, who is a relatively prominent member of the Gulf Empire’s Noble Council. Foreword: In the following interview, Dr. Clarke and Milkshake discuss the Methuselah Project. Note: Like all instances of SCP-3778-A, Milkshake uses different speech patterns, some cultural, others innate to her biology. The transcript below does not modify these patterns, but does provide translations. Dr. Clarke: Yes, of course. Sorry, Milkshake. How are you today. Milkshake clicks her lips twice4. Dr. Clarke: 'fraid not, Milkshake. No grapes for right now. Milkshake droops her head and lays down on the table. Dr. Clarke: What would you like to talk about today? Dr. Clarke: Well, that’s fine. What particular points of the Methuselah Project would you like to discuss? Milkshake growls slightly and proceeds to clean herself. Milkshake is unresponsive to any further inquiry, and growls when approached by Dr. Clarke. Session ends. 1. It is estimated that the population of SCP-3778-A currently lies somewhere around 150,000 instances. 2. Not all of the “Five Tribes” actually follow a tribal form of political organization. 3. Other SCP-3778-A groups were known to exist, but only recently has communication been established between SCP-3778-A and the Foundation to allow understanding of the political divisions present. 4. Among all opossums, including non-anomalous instances, this is seen as a sign of eagerness.